608 pages | 138 B/W Illus. 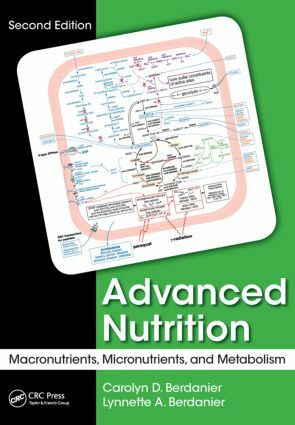 Expanded and updated, the new edition of Advanced Nutrition: Macronutrients, Micronutrients, and Metabolism continues in the tradition of its predecessor, serving as an essential textbook for advanced undergraduate and first-year graduate students studying human nutrition. The book incorporates fundamental concepts in nutrition science—while also acknowledging the contributions made by other sciences such as biochemistry, genetics, and physiology—in order to help us understand why specific nutrients are required. It provides comprehensive coverage of both macro and micronutrients, emphasizing each nutrient’s description, absorption, use, and excretion. Ancillary material designed to enhance the teaching experience is provided for instructors on PowerPoint® slides. Carolyn D. Berdanieris a professor emerita of nutrition at the University of Georgia in Athens, Georgia. She earned her BS from Pennsylvania State University, University Park, Pennsylvania, and MS and PhD from Rutgers University, Piscataway, New Jersey. She served as department head of Foods and Nutrition at the University of Georgia for 11 years before stepping down from this position to resume full-time research and teaching with a special interest in diabetes. Her research has been funded by a variety of funding agencies. Lynnette A. Berdanieris a lecturer in the Department of Biology at the University of North Georgia, Gainesville, Georgia. She teaches biology as well as anatomy, physiology, and medical microbiology. She earned her BS from the University of Nebraska, Kearney, Nebraska, and MS in physiology at the University of Georgia, Athens, Georgia. She served as a lecturer at Athens Technical College and at North Georgia College in Dahlonega prior to moving to her current position at the University of North Georgia in Gainesville, Georgia.